The overseas hub for America’s “war on terror” is the massive Ramstein Air Base in southwest Germany. Nearly ignored by US media, Ramstein serves crucial functions for drone warfare and much more. It’s the most important Air Force base abroad, operating as a kind of grand central station for airborne war—whether relaying video images of drone targets in Afghanistan to remote pilots with trigger fingers in Nevada, or airlifting special-ops units on missions to Africa, or transporting munitions for airstrikes in Syria and Iraq. Soaking up billions of taxpayer dollars, Ramstein has scarcely lacked for anything from the home country, other than scrutiny. Known as “Little America” in this mainly rural corner of Germany, the area now includes 57,000 US citizens clustered around Ramstein and a dozen smaller bases. The Defense Department calls it “the largest American community outside of the United States.” Ramstein serves as the biggest Air Force cargo port beyond US borders, providing “full spectrum airfield operations” along with “world-class airlift and expeditionary combat support.” The base also touts “superior” services and “exceptional quality of life.” To look at Ramstein and environs is to peer into a faraway mirror for the United States; what’s inside the frame is normality for endless war. That way of life is contoured around nonstop war. Ramstein is the headquarters for the US Air Force in Europe, and the base is now pivotal for using air power on other continents. “We touch a good chunk of the world right from Ramstein,” a public-affairs officer, Maj. Tony Wickman, told me during a recent tour of the base. “We think of it as a power-projection platform.” The scope of that projection is vast, with “areas of responsibility” that include Europe, Russia, and Africa—104 countries in all. And Ramstein is well-staffed to meet the challenge, with over 7,500 “active duty Airmen”—more than any other US military base in the world except the Lackland Air Force Base in San Antonio. Serving the transport needs of war efforts in Iraq and Syria (countries hit by 28,675 US bombs and missiles last year) as well as in many other nations, Ramstein is a central pit stop for enormous cargo jets like the C-5 Galaxy and C-17 Globemaster. The Ramstein base currently supports “fifteen different major combat operations,” moving the daily supply chain and conducting urgent airlifts. Last July, when Ankara gave Washington a green light to use Turkey’s Incirlik Air Base for launching airstrikes in Syria, vital equipment quickly flew from Ramstein to Incirlik so F-16s could start bombing. The officers I met at Ramstein in early spring often mentioned Africa. But the base mission of “power projection” hardly stops there. In the American foreign policy lexicon, peace has become implausible, a faded memory, a mythic rationale for excelling at war. An airlift squadron at the Ramstein Air Base, which proudly calls itself the “Fighting Doves,” displays a logo of a muscular bird with dukes up. On lampposts in a town near Ramstein’s gates, I saw campaign posters for Germany’s Left Party (Die Linke) with a picture of a dove and a headline that could hardly have been more out of sync with the base: Wie lange wollt lhr den Frieden noch herbei-bomben? “How much longer do you want to keep achieving peace by bombing?” Such questions lack relevance when war is perceived not as a means to an end, but an end in itself. More than ever, with relatively few US troops in combat and air war all the rage, the latest military technology is the filter of the American warrior’s experience. 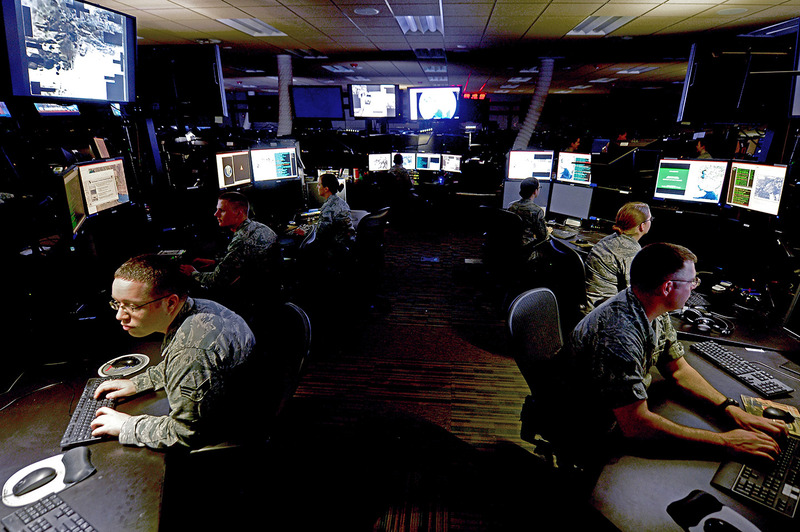 When Ramstein’s 60,800-square-foot Air and Space Operations Center opened in October 2011, the Air Force crowed that it “comes with 40 communication systems, 553 workstations, 1,500 computers, 1,700 monitors, 22,000 connections, and enough fiber optics to stretch from here to the Louvre in Paris.” (Mona Lisa not included.) A news release focused on “the critical mission of monitoring the airspace above Europe and Africa” and “controlling the skies from the Arctic Circle to the Cape of Needles.” But the Defense Department didn’t mention that the new hyper-tech center would be vital to the USA’s drone war. Worlds away, the carnage is often lethally haphazard. For example, classified documents obtained by The Intercept shed light on a special ops series of airstrikes from January 2012 to February 2013 in northeast Afghanistan, code-named Operation Haymaker. The attacks killed more than 200 people, while only 35 were the intended targets. Such numbers may be disturbing, yet they don’t convey what actually happens in human terms. But such matters are as far removed from Little America in southwest Germany as they are from Big America back home. The American drone war has long been unpopular in Germany, where polling indicates that two out of three citizens oppose it. So President Obama was eager to offer assurances during a visit to Berlin three years ago, declaring: “We do not use Germany as a launching point for unmanned drones…as part of our counterterrorism activities.” But such statements miss the point, intentionally, and obscure how much the drone war depends on German hospitality. A lawsuit filed last year in Germany focuses on a drone attack in eastern Yemen on August 29, 2012, that killed two members of the Bin Ali Jaber family, which had gathered in the village of Khashamir to celebrate a wedding. “Were it not for the help of Germany and Ramstein, men like my brother-in-law and nephew might still be alive today,” said Faisal bin Ali Jaber, one of the surviving relatives behind the suit. “It is quite simple: Without Germany, US drones would not fly.” But the German judiciary has rebuffed such civil suits—most recently in late April, when a court in Cologne rejected pleas about a drone strike that killed two people in Somalia, including a herdsman who was not targeted. Whatever the state of its democracy, Germany is continuing to enable America’s furtive warfare in Africa. Ramstein’s many roles include serving as home to US Air Forces Africa, where a press officer gave me a handout describing the continent as “key to addressing transnational violent extremist threats.” The military orders come from the United States Africa Command (AFRICOM) headquarters in Stuttgart, a two-hour drive from Ramstein. At first, AFRICOM—which calls itself “a full-spectrum combatant command”—was to be a short-term guest in southwest Germany, some 800 miles from Africa’s closest shores. A State Department cable, marked “Secret” and dated August 1, 2008, said that “no decision has been made on a permanent AFRICOM headquarters location.” Two months later, just as AFRICOM was going into full-fledged operation, a confidential cable from the US Embassy in Berlin reported that “the German government strongly supported the US decision to temporarily base” AFRICOM in Germany. Yet at the outset, as US diplomatic cables published by WikiLeaks show, tensions existed with the host country. Germany balked at extending blanket legal immunity under the NATO Status of Forces Agreement to every American civilian employee at the new AFRICOM facility, and the dispute applied to “all US military commands in Germany.” While the two governments negotiated behind the scenes into late 2008 (one confidential cable from the US Embassy in Berlin complained about the German Foreign Office’s “unhelpful positions”), AFRICOM made itself at home in Stuttgart. Nearly eight years later, the “temporary” headquarters for AFRICOM shows no sign of budging. “AFRICOM will stay permanent in Stuttgart if Germany won’t protest against it,” said the Green Party’s Ströbele, who has been on the Bundestag’s intelligence committee for almost twenty years. He told The Nation: “We do not know enough about the AFRICOM facility. Nevertheless there is the assumption that this facility is used to organize and to lead US combat missions in Africa. Because of this reason no country in Africa wanted to have this facility.” Whatever political hazards might lurk for AFRICOM in Germany, the US government finds those risks preferable to headquartering its Africa Command in Africa. And there are more and more interventions to sweep under rugs. “A network of American drone outposts” now “stretches across east and west Africa,” reports the Center for the Study of the Drone, which is based at Bard College. One of the new locations is northern Cameroon, where a base for Gray Eagle drones (capable of dropping bombs and launching Hellfire missiles) recently went into full operation, accompanied by 300 US troops, including special-operations forces. In late winter The New York Times reported that the United States “is about to break ground on a new $50 million drone base in Agadez, Niger, that will allow Reaper surveillance aircraft to fly hundreds of miles closer to southern Libya.” In March the Pentagon triumphantly announced that drones teamed up with manned jets to kill “more than 150 terrorist fighters” at an al-Shabab training camp in Somalia. Hunko and colleagues filed more than a dozen requests for explanation of drone-related policy from the German government, but he says “the answers were always dodgy.” The Merkel government deflects formal queries about Ramstein and AFRICOM by claiming to have no reliable information—a stance abetted by the center-left Social Democratic Party (SPD), now in its third year of serving as a big junior partner to Merkel’s right-leaning Christian Democratic Union. While Left Party legislators and some in the Green Party denounce the stonewalling, they have scant leverage; the two parties combined are just one-fifth of the Bundestag. Merkel’s stone wall is strengthened by the fact that some Green Party leaders have no problem with US bases. (Citing the very left-wing pasts of several key figures in today’s party, one peace activist near Ramstein tartly remarked that “the Green Party changed from red to green to olive green.”) In the affluent state of Baden-Württemberg, home to AFRICOM headquarters, the state’s Green minister-president Winfried Kretschmann is a military booster. Likewise, the drone program has nothing to fear from Fritz Kuhn, mayor of Stuttgart, the largest city in Germany with a Green mayor. Kuhn declined to answer any of the questions that I submitted in writing about his views on AFRICOM and its operations in his city. “Mayor Kuhn wants to waive the interview,” a spokesman said. More than publicly acknowledged, the economic benefits of hosting AFRICOM’s headquarters were major factors in the German government’s decision to allow it to open in the first place, a member of the Bundestag told me. With the US military footprint shrinking in the country, Germany’s political establishment saw the chance to welcome AFRICOM as very good news. Today, AFRICOM says that 1,500 US military and civilian personnel are stationed at its Kelley Barracks command center in Stuttgart. “Ramstein is a preparation center for the next world war,” Wolfgang Jung said as we neared the base. War has overshadowed his entire life. Jung was born in 1938, and his childhood memories are vivid with fear and the destruction that came with bombs (from both sides). He lost two schoolmates. His father ended up on the Russian front and died in a POW camp just after the war’s end. As a teenager, Jung saw Ramstein open, and in the decades since then he has become a dogged researcher. The base is not just about drones, he stressed. Far from it. Such matters preoccupy Jung and his wife Felicitas Strieffler, also a lifelong resident of the area. She spoke of Ramstein as a grave menace to the world and a blight on the region. Locals dread sunny days, she said, because roaring warplanes take to cloudless skies for training maneuvers. On a hillside, after climbing a 60-foot tower—a red sandstone monument built in 1900 to honor Bismarck—we looked out over a panorama dominated by Ramstein’s runways, hangars, and aircraft. Strieffler talked about a dream she keeps having: The base will be closed and, after the chemical pollutants are removed, it will become a lake where people can go boating and enjoy the beauties of nature. Such hopes might seem unrealistic, but a growing number of activists in Germany are working to end Ramstein’s drone role and eventually close the base. 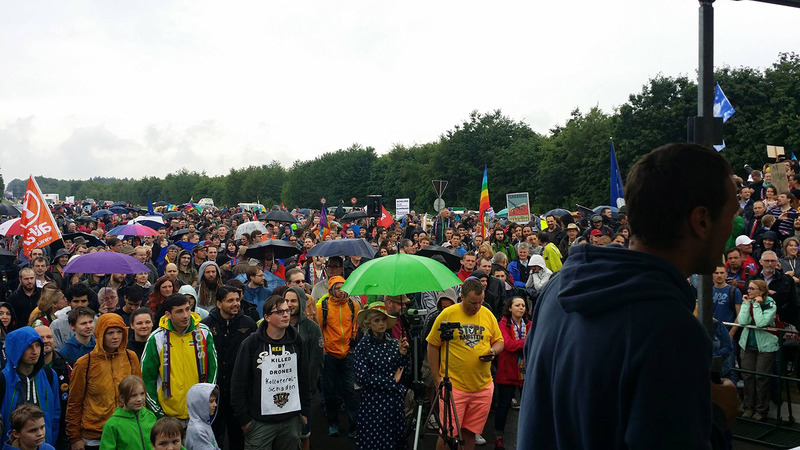 On June 11, several thousand protesters gathered in the rain to form a “human chain” that stretched for more than five miles near the Ramstein perimeter. At the Stopp Ramstein Kampagne office in Berlin, a 37-year-old former history student, Pascal Luig, exuded commitment and calm as he told me that “the goal should be the closing of the whole air base.” He added, “Without Ramstein, no [US] war in the Middle East would be possible.” With no hope of persuading the US government to shut down Ramstein and its other bases in his country, Luig wants a movement strong enough to compel the German government to evict them. The Pentagon top brass can’t be happy about the publicity in Germany connecting Ramstein to the drone war. “They like to keep these things low key, just because there are points of vulnerability,” former drone technician Cian Westmoreland said, noting that “the military is all about redundancies.” In fact, even while Ramstein’s Air and Space Operations Center was going into action nearly five years ago, a similar facility was on the drawing boards for the Naval Air Station Sigonella in Sicily. According to some sources, the ultimate goal is to replace Ramstein with Sigonella as the main site for relay of drone signals. (Replying to my inquiry, an Air Force spokesman at Ramstein, Maj. Frank Hartnett, wrote in an e-mail: “There are currently no plans to relocate the center’s activities.” He did not respond to follow-up questions.) An investigative journalist working for the Italian newsmagazine L’Espresso, Stefania Maurizi, told me in mid-spring that progress toward such a center at Sigonella remained at a snail’s pace. But on June 21, she reported that an Italian engineering firm had just won a contract for a building similar to Ramstein’s relay center. Construction at Sigonella could be completed by 2018. As part of the militarization process in Italy—“the Pentagon has turned the Italian peninsula into a launching pad for future wars in Africa, the Middle East and beyond,” author David Vine observes—Sigonella already has some infrastructure for satellite communication. Another asset is that Italy is even more deferential to the American military than Germany is. “Italy has become the launching pad for the US wars, and in particular for the drone wars, without any public debate,” Maurizi says. “Our responsibilities are huge and the Italian public is kept in the dark.” And when the Pentagon decides to build big in Italy, it doesn’t hurt the momentum that—as Vine documents in his 2015 book Base Nation—the lucrative contracts are routinely signed with Italian construction firms controlled by the Mafia. June 11, 2016 protest at Ramstein Air Base. At the top ranks, Westmoreland sees a conflict of interest: “They have an incentive to keep wars going.” For the military’s leadership, the available dividends are quite large. For instance, former NSA and CIA director Gen. Michael Hayden—an outspoken advocate of the drone program—received $240,125 last year as a member of the board at Motorola Solutions. That company has an investment in CyPhy Works, a major developer of drones. Endless war propels an endless gravy train. After leaving the Air Force, Ling went on a humanitarian mission to Afghanistan, planting trees and distributing seeds to people she’d previously seen only as indistinct pixels. The drone war haunts her. Ling asks how we would feel if armed drones kept hovering in the sky above our own communities, positioned to kill at any moment. In the Little America where the Ramstein Air Base is the crown military jewel, such questions go unasked. For that matter, we rarely hear them in Big America. Yet those questions must be asked, or the forever war will be.